It always seems like we want to start off with the most advanced “thing” available. We want the workout the pros use, the diet the magazine cover model follows, and the supplements the health guru swills down. But the most advanced isn’t the best place to start. What you should be doing is what’s best for you, not what the champ is doing right now. 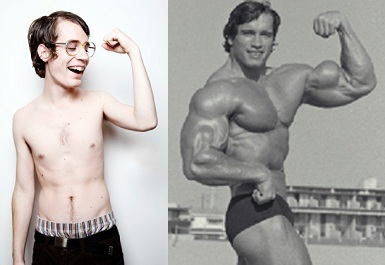 You can really see this with guys at the gym who have been bitten by the muscle bug. They want bulging biceps, thrilling thighs, and a colossal chest – and they want it NOW. So they get a copy of Arnold Schwarzenegger’s The New Encyclopedia of Modern Bodybuilding : The Bible of Bodybuilding and skip to the last section, where he details his two-times-a-day advanced workout. And they follow it faithfully, dragging themselves to the gym for endless sets of flies, curls, and extensions and curse their lack of progress until they finally burn out. See, the followed an advanced program when they were only beginners and it didn’t work. But it’s really their own fault for skipping over the foundation programs. A two-times a day workout with complicated exercises will work, as long as you’ve got something to work with. 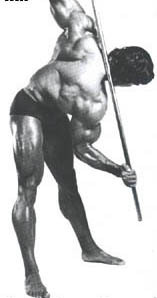 In his books Arnold actually recommends starting off with 2-6 months of basic calisthenics. He calls these workouts “freehand” exercises and they build the base that will allow trainees to move up a level in training without burning out or getting injured. “I became aware of the value of these non-apparatus exercises the summer before I began seriously working with weights. I was hanging out with bodybuilders and other athletes who when to a lake near Graz and did a one-hour exercise routine, which included 15 to 20 exercises that they just made up as they went along. They would look for a tree where they could hang on to the branches and do reverse-grip chin-ups or regular wide-grip chin ups; they would do push-ups or handstand push-ups or regular push-ups with elevated feet; they would do leg raises and sit-ups. I started working out with them and discovered after a couple of weeks that my body was toned and in better condition than it had ever been. I actually started resistance training with freehand exercises too, and then when I started going to the gym and lifting, everyone was surprised at how fast I progressed. It’s the way to go if you want to do things right. The push up is a great exercise for the chest, shoulders, and the back of your arms (triceps). 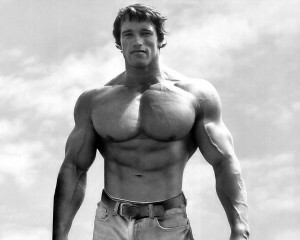 Arnold recommends starting with 50 push ups a day and working your way up slowly. The dip has been called the “king of upper body exercises.” It also works your chest, shoulders, and triceps. Dipping is more difficult than push ups, because you’re working with a higher percentage of your body weight. Arnold recommends working your way up to 50 total reps for the workout. Once you’re strong enough, aim for 5 sets of 20 reps. The body row is a great exercise for your back muscles – your lats (wings), upper back, and middle back. It’s important to keep your body absolutely straight during this exercise. Work your way up to 50 total reps in your workout. Sit ups are a great way to work your upper abdominal muscles. It’s important to keep the movement smooth and rhythmical – focus on the stomach muscle contraction. 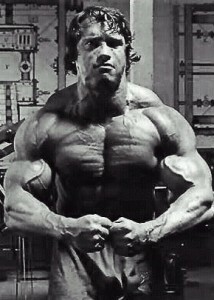 Arnold recommends doing two sets of 50 reps. Once you get comfortable, move up to 200. While the sit up will work your upper abs, the bent leg raise (or reverse crunch) works your lower abs. Arnold recommends a minimum of 50 reps.
Arnold put this exercise in for your obliques – the muscles at the sides of your waist – and your lower back. If you do this one right, you’ll feel your sides working. If you do it wrong, you’ll feel the twist in your low back. Start with 50 reps and work your way up. Squats are THE exercise for building your legs and strengthening your hips. They also build flexibility through your lower body that you will need later for more advanced exercises. It’s very important to keep your body as upright as possible while squatting, to keep the work on your thighs and not your lower back. Arnold recommends 50 to 70 reps. 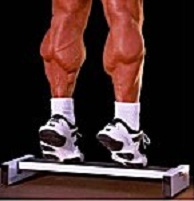 Your leg development will never be complete if you skip working your calves. Do the calf raise off a step or off a book to work the full range of motion. Really flex and tighten your calf at the top of each rep to get the most benefit out of the exercise. Arnold recommends at least 50 reps.
Chin ups and pull ups require an overhead bar. You can use one at the gym, at the park, or get one that fits across your doorway. Chin ups are tough when you do them right but the benefits are enormous for your arms and back. Strive to make each rep smooth and pull yourself as high as possible. Concentrate on each exercise. Feel what your muscles are doing as you move. Good form is more important than the number of reps. Add more reps/resistance as you progress, but never at the expense of good form. After your workout stand in front of a mirror and assess your progress. Practice a few poses. Put your heart and soul into your training, diet, and sleep programs.